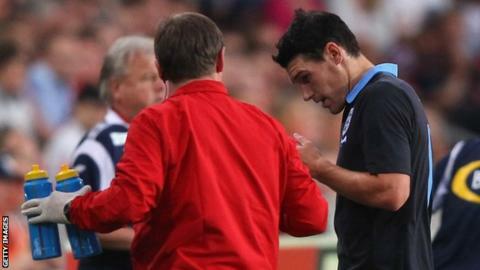 Gareth Barry will undergo a scan on a groin injury on Monday as he emerges as a serious injury concern ahead of England's Euro 2012 campaign. Manchester City midfielder Barry limped off after coming on as a half-time substitute as Roy Hodgson started his reign as England manager with their first win in 32 years against Norway in Oslo. Hodgson's pleasure at starting with a 1-0 victory was marred by the problem suffered by Barry - and which may require him to draft in a replacement before Tuesday's final deadline to name his squad for Poland and Ukraine. "I'm not prepared to say it is serious," said Hodgson. "But it is certainly going to dominate our attention and we don't have a lot of time if the scan shows there is something more than minor [damage]. "I spoke to Gareth and he told me 'I think I need a scan'. Something happened during the course of the game and now we need to see how it is." Hodgson refused to be drawn on whether Liverpool's Jordan Henderson, who is on stand-by and replaced Barry when he was taken off, would automatically step up into the squad. Alternatively, the recently appointed boss may decide to promote Everton defender Phil Jagielka, who played 90 minutes against Norway, from his back-up list. Hodgson was satisfied with Scott Parker, who played for almost an hour as he recovers from an Achilles injury, while Manchester United pair Phil Jones and goalscorer Ashley Young were substituted as a precaution after feeling tight hamstrings. The England manager added: "I am pleased with this result. I am not prepared to be critical of the team in any way but I am also aware it is a work in progress. After only three days with the team we have come here and given a more than reasonable performance at a place where we know it is very difficult to get a result." Steven Gerrard felt the anger of Norway's supporters after a first-half tackle that resulted in Tom Hogli being taken off injured - but Hodgson defended the England captain. He said: "I thought it was a fair tackle. There was certainly no intention to injure the player and there was no question of his studs being up. I thought it was a very strong and brave tackle and one I hope my players are going to be putting in in the Euros."